It's been a cold winter so far in the north east! Luckily, it's been warming up and the weather has been bearable lately, but I wouldn't be surprised if we got hit with more cold weather and snow soon. I went farther north for a little get away weekend with some girlfriends, and we had so much fun in the snow! We went snowshoeing on the lake, watched a hockey game, and went down a toboggan slide. I made all the girls beanies to keep warm during the trip, and they absolutely loved them! 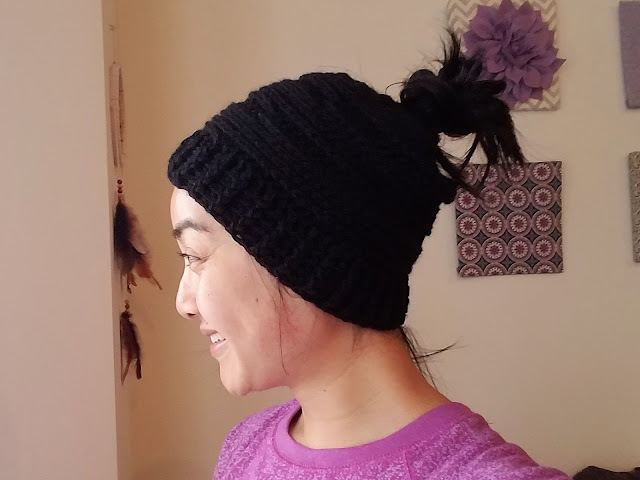 While we were out shopping around in the little shops, one of my friends saw a messy bun beanie that she wanted. I don't know about you guys, but I'm always hesitant to buy things I know I can easily make. I mean, I love getting inspiration from things I see in shops, but it's always a little more special when I know I can create it myself. I told my friend that I can make the beanie for her, and I knew it'd be a good opportunity to design and create a pattern! It seems like forever since I've written a pattern. I hope she loves it! It's worked around a hair tie so that it'll be nice and snug around your bun or ponytail. You may sell the finished product from this pattern, but please reference and link this post. Please don't claim this pattern as your own or sell the pattern. I'd love to see pictures of your finished product! You can put them up on Ravelry or post it on my Facebook Page. Don't forget to follow me on Instagram! 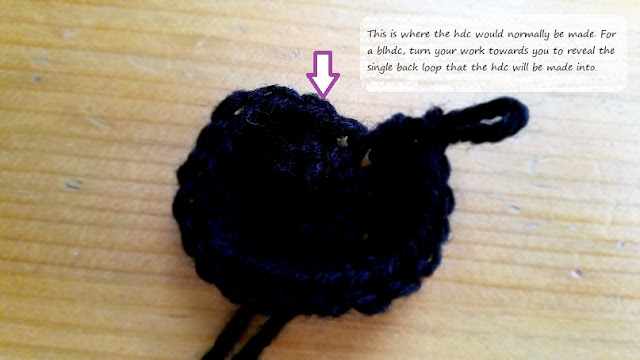 Yo, insert hook from back to front around the post (rather than the top of the stitch), yo, pull up a loop. Yo, pull through two loops, yo pull through last remaining loops. It's the same as a normal double crochet, but the only difference is that it's worked around the post rather than the top of the stitch. Yo, insert hook from front to back around the post (rather than the top of the stitch), yo, pull up a loop. Yo, pull through two loops, yo pull through last remaining loops. Where the pattern calls for a blhdc, the hdc is worked in the single back loop of the stitch, rather than the two top stitches. 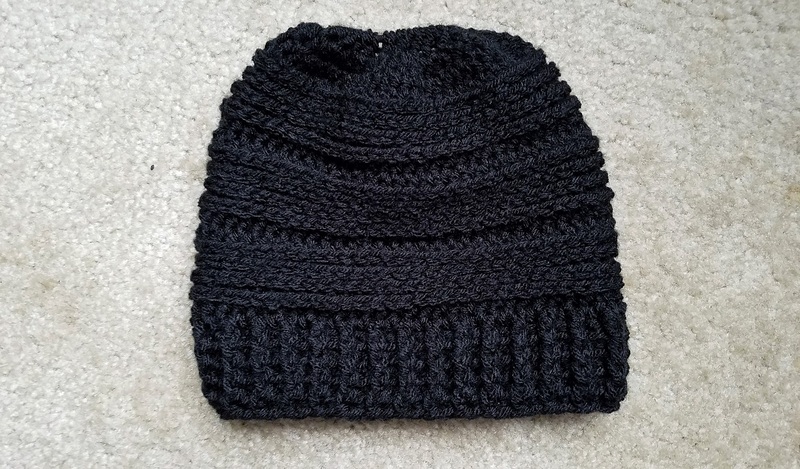 This creates the horizontal rows on the beanie. 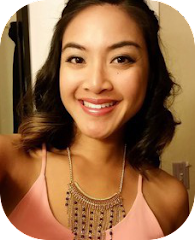 - If you'd like to use yarn that's a different color than the hair tie, you can slip stitch around the hair tie before starting the pattern. 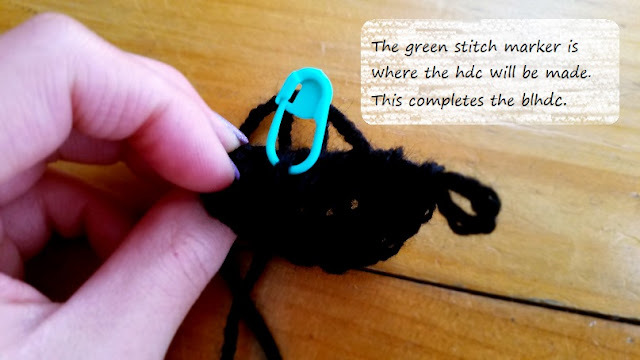 - This pattern is worked in the round, so use a stitch marker at the beginning of each round. - This pattern will fit most adult female heads. *fpdc around stitch, bpdc around next stitch* repeat from * to * around, ending on a bpdc.